Five years in, NASA’s Commercial Crew Program is at the doorstep of launch for a new generation of spacecraft and launch vehicles that will take astronauts to the International Space Station, enhance microgravity research and open the windows to the dawn of a new era in human space transportation. The agency asked industry to take the lead in designing, building and operating a space system that would carry astronauts. NASA offered its expertise in human spaceflight and wrote out the top-level requirements for safety and other considerations to prepare for flight tests. NASA will certify the vehicles for flight tests and finally operational missions. The companies apply their own knowledge and skills in designing, manufacturing and running the systems. Ultimately, NASA will buy the flights as a service from the companies. 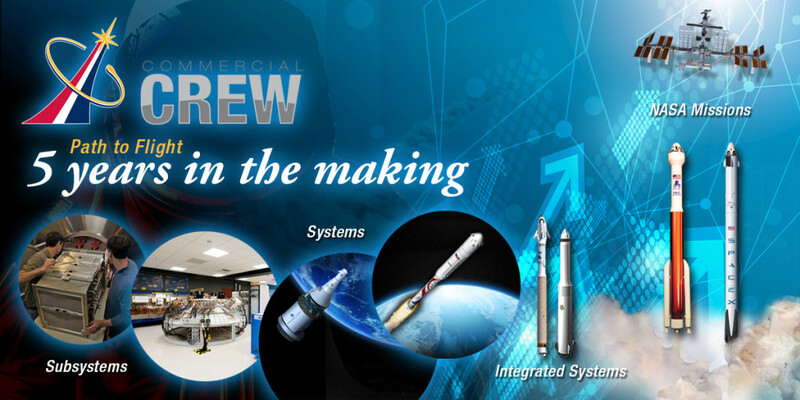 “It’s what we hoped the program to be and honestly a lot more,” said Wayne Ordway, who began as the manager of the Commercial Crew Program’s Spacecraft Office and rose to the position associate program manager. 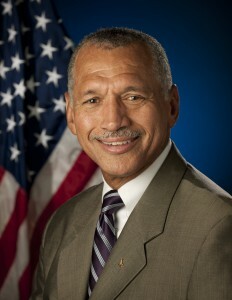 This progress was hoped for, but took tremendous work and flexibility, according to members of the early efforts to transform the fledgling vision of a close partnership between NASA and private industry into a functioning organization capable of establishing requirements for a new generation of human-rated spacecraft and then seeing to it that those requirements were met. A full-scale engineering test article of Sierra Nevada Corporation’s Dream Chaser spacecraft is nearing completion leading to a second round of atmospheric evaluations at NASA’s Armstrong Flight Research Center in Edwards, California. 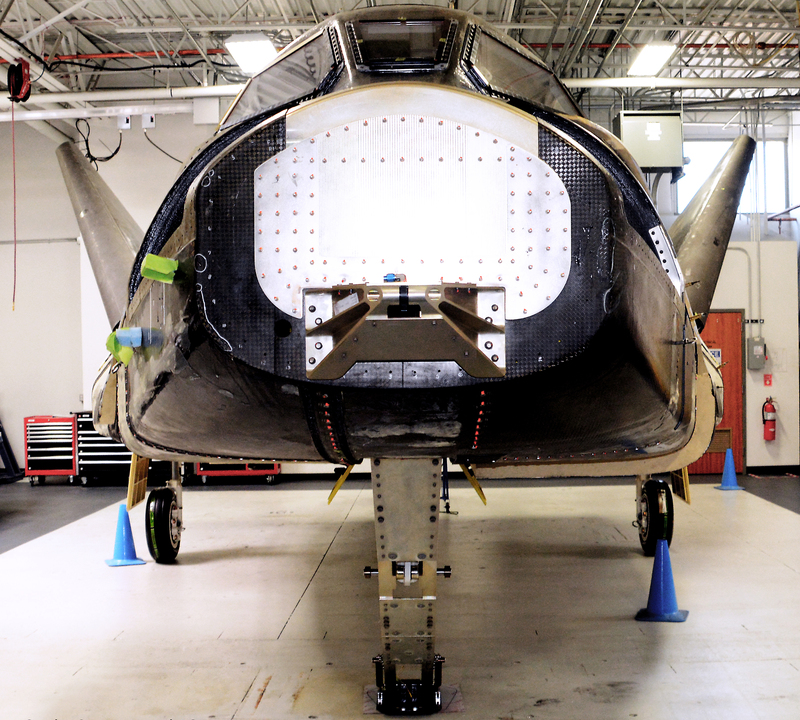 The flight testing, which calls for the Dream Chaser to be released high over California’s Rogers Dry Lakebed and glide to a safe landing, will build upon an earlier free-flight test milestone that returned valuable data for the design team. In a presentation at the International Symposium for Personal and Commercial Spaceflight, the company said it has included numerous modifications to the latest version of the Dream Chaser, including structural and systems improvements to its composite wings and aeroshells. The company also maturated its avionics and software, as well as guidance and navigation and control systems. Completing a second free-flight test is part of the Space Act Agreement between Sierra Nevada Corporation and NASA under the Commercial Crew Integrated Capability (CCiCap) development phase of the Commercial Crew Program. 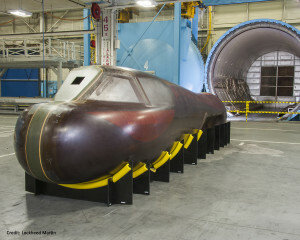 In addition to the engineering test article upgrades, the company has made significant progress on the build of the first Dream Chaser orbital vehicle, the design for which will be reviewed during a future CCiCap milestone. Dream Chaser is designed to carry humans safely into low-Earth orbit inside the winged spacecraft flying a mission profile similar to that of a space shuttle. Like the shuttle, Dream Chaser will be capable of gliding back to a runway landing at the end of the mission. 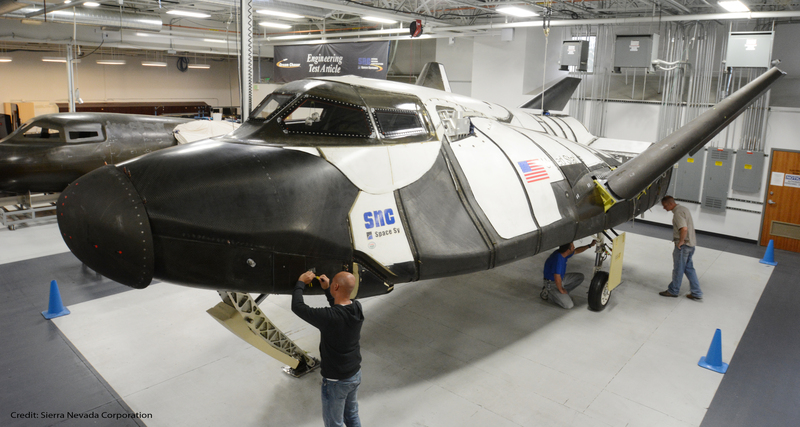 Sierra Nevada Corporation’s Dream Chaser engineering test article is being prepped for its second free-flight test at NASA’s Armstrong Flight Research Center in California later this year. 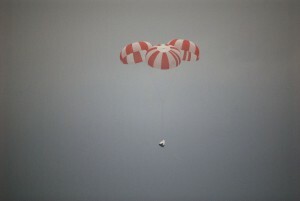 The flight test is a milestone under NASA’s Commercial Crew Integrated Capability (CCiCap) agreement with SNC. The wings, windows and landing gear are installed. 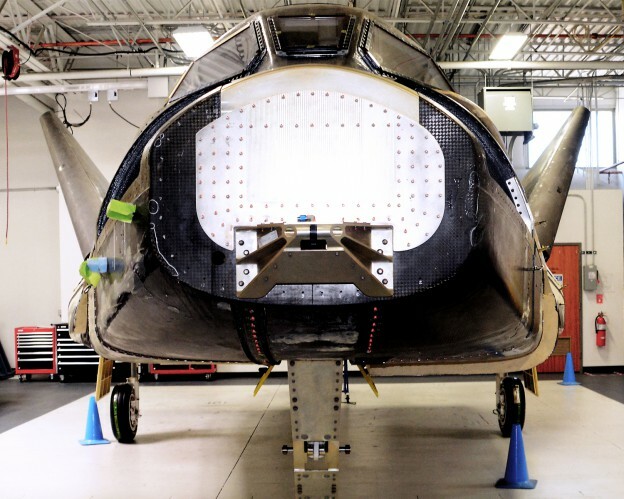 The Dream Chaser’s the nose skid will have thermal protection system tiles on the vehicle, manufactured at Kennedy Space Center’s Thermal Protection System Facility, for the flight test. The performance of the tiles will be assessed following the touch down on the runway. SNC will share their thermal protection system work and a status of the Dream Chaser spacecraft to media and social media attending CRS-7 activities at Kennedy Space Center next week. 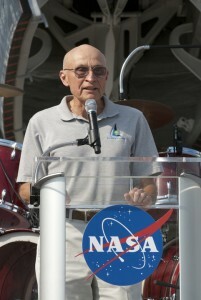 Legendary former launch director Bob Sieck has seen countless launches of all sorts from Florida’s Space Coast during a distinguished career that began during Gemini and lasted through most of the space shuttle era. 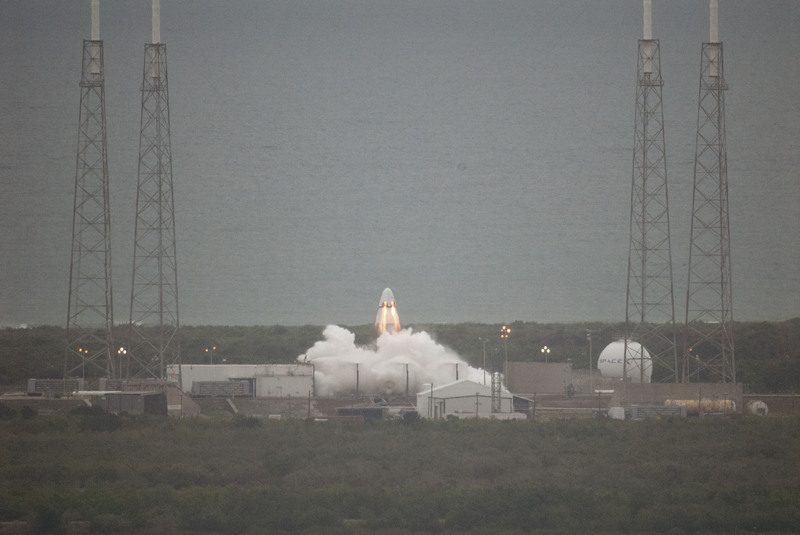 But watching today’s test of the SpaceX Crew Dragon from Kennedy Space Center was substantially different, he said. In case you are wondering where prior crew escape systems were tested, the launch escape systems for Mercury capsules were tested at Wallops Island, Virginia, and the Apollo escape tower was tested at White Sands, New Mexico. Gemini used ejection seats for its astronauts. None have been tested at Cape Canaveral until today. 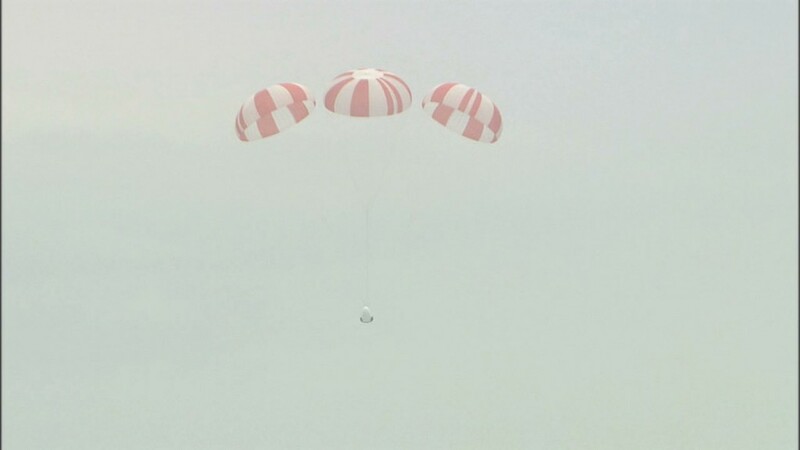 A loud whoosh, faint smoke trail and billowing parachutes marked a successful demonstration Wednesday by SpaceX of its Crew Dragon spacecraft abort system – an important step in NASA’s endeavor to rebuild America’s ability to launch crews to the International Space Station from U.S. soil. The successful test of the spacecraft’s launch escape capabilities proved the spacecraft’s ability to carry astronauts to safety in the unlikely event of a life-threatening situation on the launch pad. The Crew Dragon simultaneously fired its eight SuperDraco engines at 9 a.m. EDT and leapt off a specially built platform at Cape Canaveral Air Force Station’s Space Launch Complex 40 in Florida. The engines fired for about six seconds, instantly producing about 15,000 pounds of thrust each and lifting the spacecraft out over the Atlantic Ocean before jettisoning its trunk, as planned, and parachuting safely into the ocean. The test lasted about two minutes from engine ignition to splashdown. The flight test is a vital milestone in the company’s development effort and furthers its plan to meet a major requirement for the next generation of piloted spacecraft — an escape system that can quickly and safely take crew members away from their rocket while on the pad and through their ascent to orbit. SpaceX can use the test data to help refine its aerodynamic and performance models, and its design, to help ensure crew safety throughout all phases of flight. 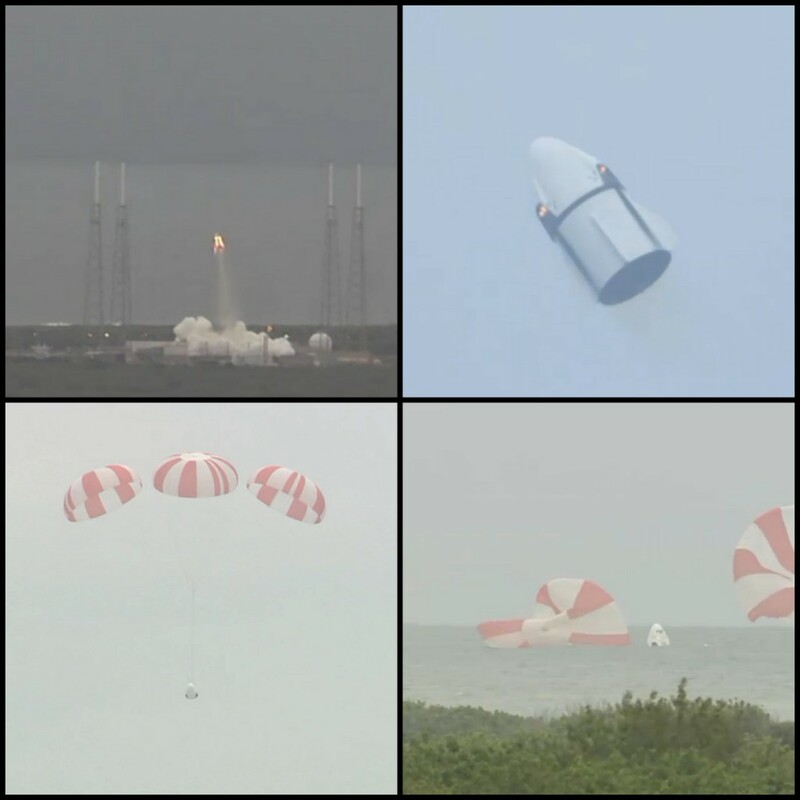 The test was the first with a full-size developmental spacecraft using a complete set of eight SuperDraco engines in the demanding real-world conditions of a pad abort situation. 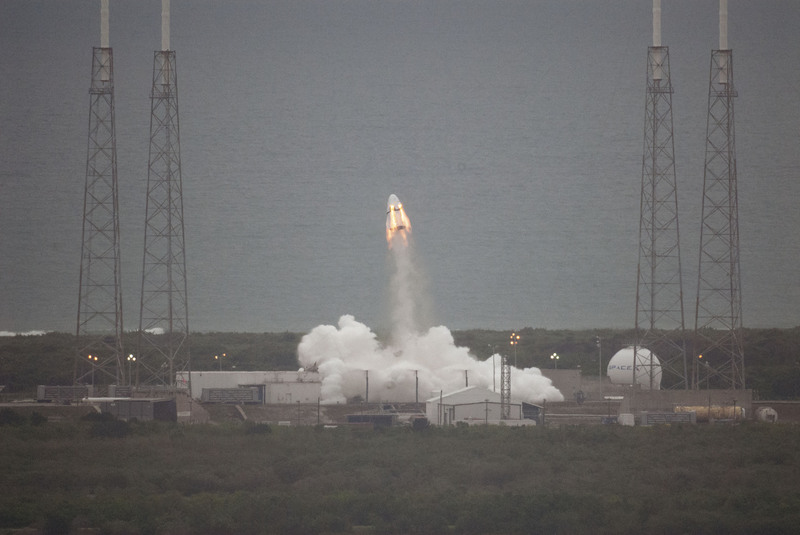 SpaceX built the SuperDracos for pad and launch abort use. Each engine, the chambers of which are 3-D printed, burns hypergolic propellants monomethylhydrazine and nitrogen tetroxide. More than 270 special instruments, including temperature sensors and accelerometers, which are instruments that measure acceleration, were strategically placed in and around the vehicle to measure a variety of stresses and acceleration effects. A test dummy, equipped with sensors, went along for the ride to measure the effects on the human body. To further maximize the value of the test, weights were placed inside the capsule at crew seat locations to replicate the mass of a crewed launch. 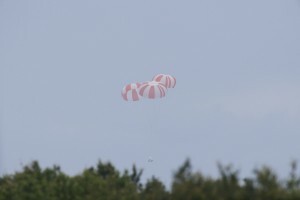 The trunk, an unpowered cylinder with stabilizing fins, detached from the spacecraft when it reached maximum altitude and fell back to Earth, while the capsule rotated on as planned for a couple seconds before unfurling its drogue parachutes, which then deployed the main parachutes. 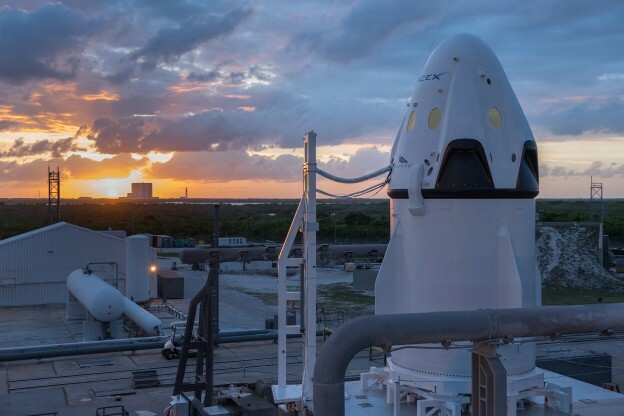 Boat crews have begun the process of retrieving the Crew Dragon from the ocean and returning it to land for further analysis. 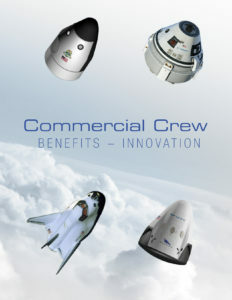 Spacecraft development and certification through the Commercial Crew Program is performed through a new arrangement that encourages innovation and efficiency in the aerospace industry, bringing to the process the space agency’s expertise in the form of safety and performance requirements for the spacecraft, boosters and related systems. The pad abort test is a payment milestone funded by the Commercial Crew Program under a partnership agreement established with the company in 2012. The agency awarded contracts last year to Boeing and SpaceX to build their respective systems for flight tests and operational missions to the space station. 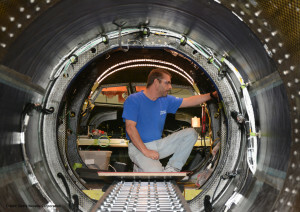 Known as Commercial Crew Transportation Capability (CCtCap) contracts, the awards allow continued work on Boeing’s CST-100 and SpaceX’s Crew Dragon at a pace that is determined by their respective builders, but that also meets NASA’s requirements and its goal of flying crews in 2017. “Our partners have met many significant milestones and key development activities so far, and this pad abort test provides visual proof of one of the most critical safety requirements — protecting a crew in the event of a major system failure,” Lueders said. NASA already is preparing the space station for commercial crew spacecraft and the larger station crews that will be enabled by SpaceX’s Crew Dragon and Boeing’s CST-100. NASA plans to use the new generation of privately developed and operated spacecraft to carry as many as four astronauts each mission, increasing the station crew to seven and doubling the amount of science that can be performed off the Earth, for the Earth.